I got down to made a batch of Cranberry Walnut Oatmeal cookies yesterday morning after I heard the evening before, that my DG will be able to meet up with my DH overseas today. These cookies were adapted from the chocolate oatmeal cookies in my previous post. Instead of chocolate chips, I replaced it with dried cranberries and omitted the chocolate called for in the original recipe. You may think that these healthy, wholesome ingredients would probably produce cookies that taste like bland muesli or have a texture similar to cardboards. On the contrary, these cookies taste fabulous! Nice, crunchy exterior and a slightly soft, chewy interior. The cookies smell awesome too, thanks to the vanilla extract (Nelson-Massey Madagascar Bourbon Pure Vanilla Extract) I used. The dried cranberries provide just the right sweetness, as the sugar used is probably just enough for creaming the butter. The walnuts give the added nutty texture while the rolled oats provided a delightful chew. Preheat oven to 190degC. Line baking trays with parchment paper. With manual whisk, cream butter and sugar in a mixing bowl until the mixture turns pale and fluffy (alternatively use an electric mixer if desired). Dribble in the egg gradually. Mix well after each addition. Add in salt and vanilla extract, mix to incorporate into the batter. Sift the flour over the batter, fold in with a spatula. Add rolled oats, walnuts and dried cranberries. Mix well with the spatula. Drop tablespoonfuls of the cookie dough onto the prepared baking tray. Leave some space between the cookies to allow for spreading (actually, they don't spread too much). Flatten each cookie dough slightly with the back of a fork, keeping the shape as even as possible. Bake for 8~10 mins or until golden (my oven took 12~15mins). If necessary, rotate the baking tray halfway through the cooking time to ensure even browning. Transfer to a wire rack to cool completely. Store in air-tight containers. Hayırlı pazarlar. Çok leziz görünüyor. Ellerinize sağlık. Yup! This is definitely a keeper and the recipe is so flexible that substitution is not a problem! Anything is good when it is made out of love. I feel guilty now! I'm never quite a fan of oatmeal cookies and have never attempted anything close. But my bf, D, is a huge fan of oatmeal cookies and now I feel guilty for not ever thinking of trying this! What better way to express yourself with a simple tin of cookies. Está tudo muito lindo, criativo e de bom saboroso. Hi HHB, these look really good! May I know if these are chewy or crispy type? Shirely, the exterior is crispy but the inside is a little soft and chewy...not the usual chewy chewy oatmeal cookies you get from American recipes. 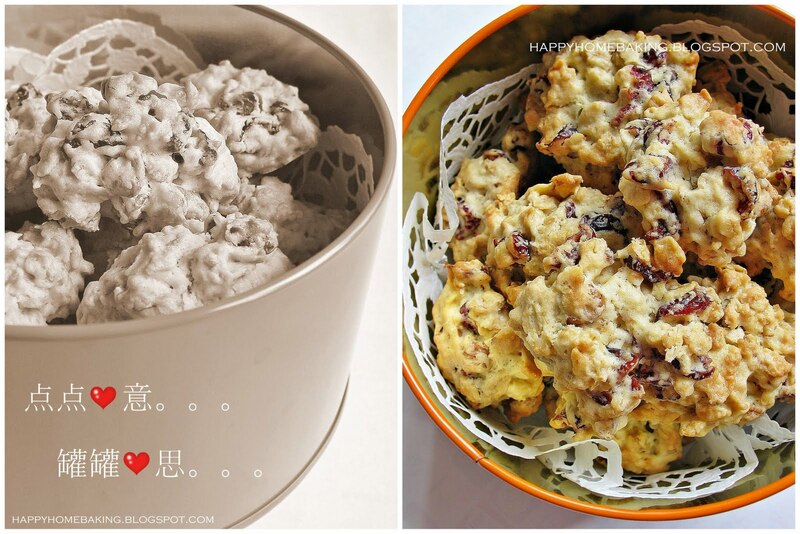 Your bakes always impress me with your passion and 心思! Thank you for sharing your baking experience, easy-to-follow instructions and recipes - as I do not have any baking skills. I have tried Baking with kids - making pizza dough, banana and chocolate chips muffins, chocolate fondue and heart-shape bread and they tasted delicious. My family and I had a enjoyable bonding time. In time to come, I will try to bake other recipes too. The taste of home is always the best! A bit of home cooked goodness and love all bound up in a little cookie - nothing beats this. Wah... I'm sure your DH will 甜到心都流. (I hope I wrote it correctly). If I am him, Gosh.. how to eat these, one eaten means one gone... but one bite into these cookies will bring me one step nearer to home.. Even my heart is melting when I see these. hahahaha!!! No..no. I never think that the cookies taste like bland muesli or have a texture similar to cardboards. By looking at ur pictures and the ingredients used, I know these cookies are 100% yummy. I like to bake with oats too. HHB, that was VERY sweet of you to do so! I doubt I'd even eat the cookies because they're made with lots of TLC -- plus, they traveled miles just to reach my hands! Would like to ask which camera/model you use? And are you using any photo editing software? All the photos you posted are so well-taken and delicious..
Hi HHB, how did you add the chinese text to your photos? I use try using photoscape but it does not allow me to type in chinese words. Hi Anonymous, to add Chinese text, you need to select the font "SimHei", let me know if you still have any problem. this look too beautiful, your hubby is lucky to have you, a good wife and a good mom! Happy Baking!! That was very lovely of you to share your experience and knowledge with us. Thanks a lot. Hope to see your recipes soon. just wondering why ur cookies are white? Did you coat them in white chocolate? Hi, I am new in baking.. And tried your Chocolate Oatmeal Cookie yesterday. But the cookie turned out to be quite soft inside NOT crispy. What should I do to rectify this "softness"? Mag, these cookies are meant to be a little soft on the inside, not crispy and crunchy. You can bake them a few minutes longer, and also maybe you can lower the temperature a little, I suspect your oven temp is a little high, so the outside is browned (is that right?) but the inside is still uncooked? Hi octopusmum, I am also using a small tabletop oven, so I usually bake small batches of cookies. I am glad you pick up baking cookies again. It is much healthy to bake your own as you know what goes into the cookies, I hope your children like these as much as you do :) I was making a batch of granola bars just now, they are even more healthier than these, just oats, nuts, dried fruits and milk, no sugar, no honey or butter. Can share your granola recipe? btw, i ate the cookies again this morning. found that the inside is soft and the outside not as crispy as yesterday. my no 2 said it is nice but no 1 said it didn't taste like store bought cookies. i guess he is too used to the much sweeter cookies i always bought from Marks & Spencer. i am going to bring some to office tomorrow to ask my colleagues for their opinion. btw, how long can these cookies be kept? should i keep in the fridge so that they last longer? Want to also say HAPPY TEACHERS' DAY to you! First of all, Thanks for being so patient and taking your time to answer ALL our questions! Have an enjoyable and restful day! I thought you have mistaken me as a school teacher, lolz! Nah, I am no teacher, I'm just sharing my experience, and actually I learn so much more by answering questions from readers. The only thing that worries me is I am not the blind leading the blind! i ate one more juz now and the outside has turned soft :( i checked the container and realised that i have not closed it properly. i used those tins which Prima Deli used to sell their CNY cookies in, the metal type with a latch. sob sob, guess i have to try and finish them asap ! good luck in your granola bars attempt! Octopusmum, I used lock & lock, so far this is the best brand of air tight containers. Also, you must know the right way to store, ie use the right size, the cookies must fill up the container, so that there is not too much air space. of course, as the cookies are finished up, the air space will get bigger, if you really want to keep longer, than transfer the remaining cookies to a smaller container. This method applies to all cookies that you want to keep fresh and crispy. will take note of your useful tips in future! Thank u for sharing your wonderful recipes & tips! My hubby-to-be enjoyed these tasty treats alot and my colleagues are always in awe of these tasty treats! I did this cookies! This type of cookies are not my favorite, but I really liked these ones. I changed it a little. I used the same basic ingredients, but instead walnuts I used a mixture (80% unsalted pistachio, a few almonds, pine nuts, macadamia all unsalted). I did not have cranberries, but I added raisins, and some white chocolate cut in small pieces. hi roselind here. is one egg enough? if i want to bake more cookies, do i have to make the mixture two rounds or do you have other measurements? and do i need to apply a layer of butter on the baking tray? alright! thank you very much for your help. will drop by again. haha..
hi it's me again. haha.. just want ask can i use white fine sugar to replace caster sugar? and can i keep the cookies in container? Hi Roselind, please use caster sugar and corn flakes will not be a good substitute. Hi Roselind, I tried making 2 batches and they turn out fine. 1 recipe is just nice for 1 tray. Hi, it is not necessary to toast the walnuts, however, if the walnuts I bought have been kept for some time, I will toast it before using. hope this helps and happy baking!